‘Fencers are problem solvers,” said Philip Dershwitz. 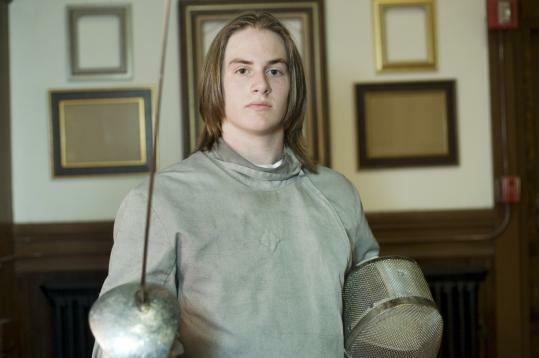 The 15-year-old sophomore at Dover-Sherborn High School took first place in the men’s Division 2 sabre category at this summer’s national fencing championship. During a bout, Dershwitz said, competitors have a set period of time to figure out the best way to simultaneously attack and dodge an opponent, factoring in distance and technique. Dershwitz has fenced all three events in the sport of fencing: Epee, which uses a sword with a triangular blade and a large guard; foil, which has a rectangular blade and a small guard; and sabre, the modern version of the slashing cavalry sword, with a flat blade and a guard. Fencing is performed on narrow strip, or piste, 14 meters long and 2 meters wide. The US Fencing Association says the piste is set up to replicate combat in confined quarters such as a castle hallway. The end of the fencing strip represents the age-old line drawn in the dirt by duelists; to retreat behind it was an indication of cowardice, and brought with it a loss of honor. Fencing has been an Olympic sport since 1896. While Dershwitz has no immediate goal of going for the gold, he hopes to make the national team and go to the world championships. He also plans to fence in college. Dershwitz started fencing at the age of 8, attending a program at Tenacre Day Camp in Wellesley. He then signed up for Saturday classes at the Zeta Fencing Studio in Natick, where he began training with Tulum. At the time, he was still playing baseball, soccer, and lacrosse, and “my mom was going nuts trying to get me everywhere.” By the time eighth grade rolled around, Dershwitz had dropped the other sports and was fencing four days a week. Dershwitz said he approaches each match by assessing an opponent’s strengths and weaknesses. For the most part, he said, he’s been fencing against the same people for nearly a decade, but when someone he’s unfamiliar with walks onto the strip, he takes mental notes and later jots them down. “I sit there laughing because I would rip these guys apart,” he said. “It’s a running joke among fencers that Hollywood is a completely theatrical and inaccurate representation of fencing because it’s supposed to look cool.” In reality, said Dershwitz, if someone so much as turned around they’d get hit. Dershwitz knows that fencing isn’t at the top of the list of high school spectator sports. “I end up spending a lot of my time explaining to football players why fencing is in fact a sport, and not a sport for wusses,” said Dershwitz. In fact, Dershwitz looks a bit like high school football player, at 6 feet tall and 175 pounds. When Dershwitz isn’t wielding a sabre, he can often be seen carrying a saxophone as a member of the Dover-Sherborn High School jazz band. He has an eclectic taste in music, which ranges from Miles Davis and Art Blakey to Candlemass, a heavy metal band from Sweden. “I don’t listen to anything mainstream,” Dershwitz said. His favorite classes in school are chemistry and biology. His father, Mark, is a physician who holds a doctorate in pharmacology and is vice chairman of anesthesiology and a professor of biochemistry and molecular pharmacology at the University of Massachusetts Medical School in Worcester. His mother, Renee Goetzler, is an internist at Caritas Carney Hospital in Dorchester. Tulum, a 51-year-old Natick resident, grew up fencing in Belgrade. At the age of 19 he won the junior national championships in Yugoslavia in epee, foil, and sabre. He received a degree in architecture and design from the University of Belgrade and worked as a product designer while coaching fencing at night and on weekends. In 1985, Tulum was invited to become the assistant fencing coach at Harvard University. He remained in Boston for two years and then took a coaching position at Stanford University, where he worked for over a decade. In addition, he was a coach for the US national men’s team. Tulum returned to Boston and took a job as a product designer while he helped out with the fencing program at the Dana Hall School in Wellesley. Seven years ago, a parent of one of his students tipped him off to a lease coming open in the old Odd Fellows building in Natick Center. Tulum snapped it up for his fencing classes. The Zeta Fencing Studio has an Old World European style. The art on the walls are prints of fencers from the 1800s. Oriental carpets and period furniture fill the upstairs, which overlooks the 2,500-square-foot studio. Fencing classes often listen to classical music or jazz. Tulum said he takes pride in surrounding his students with visual and audio culture. For more on Zeta Fencing Studio, visit zetafencing.com.